"Valley Of The Heart's Delight"
Halt And Catch Fire is very much about finding the it, as its characters all seek to make sense of—and exploit—the new frontier of the internet and personal computing. Having decamped from their Texas home base of the first two seasons for Silicon Valley, the show’s four main characters are chasing the it wherever it leads them. But chasing that elusive it means risking failure and—as reinforced by the earthquake that unsettles the new California transplants tonight—realizing they’re on unstable footing. That’s where Donna and Cameron find themselves in this altogether sure-footed premiere. Mutiny has expanded as they’d hoped, topping 100,000 users, but there are cracks at their feet. Their new dedicated mainframe—constructed by Donna and husband Gordon—barely boots up in time to impress the Infoworld reporter on hand to write a story about the company. The constant shenanigans of Mutiny’s rambunctious coders send showers of dust and debris down on the mainframe through the rickety floor. Cameron’s overenthusiastic firecracker celebration sends Gordon scurrying for the fire extinguisher. New coder Ryan (Manish Dayal) reveals that Mutiny’s popular private chatrooms are astoundingly easy to hack, exposing users’ conversations. Meanwhile, Gordon’s neurological condition has worsened to the extent that he and Donna have a seismograph-like 1-to-10 code for the severity of flareups. (Seeing his twitching hand after 20 straight hours of work on the mainframe, Donna asks for a reading, and Gordon unconvincingly assures her “Two. Three max.”) When the earthquake finally does come, the metaphor’s clear—chasing your dreams in this world means sacrificing any semblance of security. That fact is central to the very satisfying development of Cameron and Donna becoming Halt And Catch Fire’s true protagonists. Much was made last season of the fact that the show—after season one’s focus on Joe and Gordon’s entrepreneurial exploits—became the story of two strong female characters forging their own company. And points to series creators Christopher Cantwell and Christopher C. Rodgers on that front. But what was, and remains, so exciting about Donna and Cameron’s journey—setting aside the stellar work of Kerry Bishé and Mackenzie Davis—is how they’re permitted to screw up like everyone else in this strange new world. (As their online avatars tour the virtual neighborhood they’ve created, they literally come to the end of the world, underscoring that they’re now the ones making the maps.) Donna and Cameron are making mistakes, but they’re a lot more human than when Joe MacMillan was pulling everyone’s strings. Plus, Davis and Bishé imbue Cameron and Donna with such palpable enthusiasm for their shared venture that their shop talk is thrilling in itself. They have blind spots—neither recognized the “gaping holes” (as the insensitive Ryan puts it) that they’d left in Mutiny’s security, and both brush off Ryan’s suggestion to diversify Mutiny to address the growing needs of their consumers. (Cameron does have Bosworth offer him a 15 percent raise in order to keep their brilliant but difficult new employee from getting too restless.) Cameron also continues to be a lot better with code than she is with other humans, tonight accidentally revealing to a grieving father—who’s looking to trade some of his dead son’s computer equipment—that she’d seen the printout of one of his private chats. She’s also still crashing with Gordon, Donna, and their daughters, seemingly oblivious to the friction that’s causing. The four main characters are all visionaries of their own type, but the show continues, compellingly, to chart just how much hard work—and failure—goes into transforming vision into reality. Scoot McNairy grippingly delivers Gordon’s tale of Joe stealing his Sonaris program (and turning it into the wildly successful corporate antivirus company MacMillan Utility) with haunted resentment, rejecting the coders’ assessment of Joe as simply a glib opportunist. No. No, no, no—don’t you do that. Don’t you underestimate him. That’s when he’s most dangerous. No, Joe’s brilliant. When you’re in that guy’s thrall it feels like a drug. You know, you feel like the most important person in the world. That’s when you wake up with your neck slit, bleeding all over the floor. Apart from McNairy’s performance, which admits so much of Gordon’s self-loathing at having been manipulated by Joe again and again, the speech underlines how Halt And Catch Fire seems to have subtly addressed the Joe MacMillan problem at its center. Initially, the show leaned heavily on a central character without enough substance to bear the weight. Joe the mystery man proved less mysterious than inconsistent—a construct rather than the conflicted genius meant to carry Halt’s narrative. 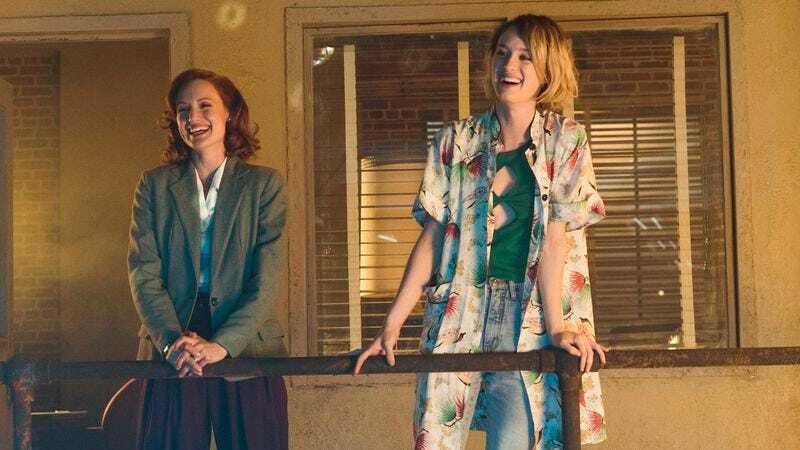 The show improved significantly when initially secondary characters Cameron and Donna emerged as the more rounded and compelling leads, thanks both to the talents of Kerry Bishé and Mackenzie Davis, and because Donna and Cameron weren’t saddled with writerly contrivance from the outset. Which is not to slight Lee Pace, a vivid, expressive actor who’s always made Joe MacMillan entertaining, even when Joe’s actions smacked of artifice. Indeed, when we finally do see Joe in the flesh in this first episode, both he and Halt embrace Joe’s protean nature to the fullest. At a packed theater, Joe gives himself a backlit, rock-star entrance, searches the wings like a Method actor, and then launches into another signature Joe MacMillan sales pitch, this time for a free home version of his “gold standard” antivirus software. Throughout, he feints toward a red-cloth-draped box which, once he expertly reveals it at the crescendo of his presentation—contains nothing. It’s a virtuoso turn from Pace—and from Joe. Sporting a natty beard, wire-rimmed specs, and carefully casual open blazer, Joe has transformed himself once again, this time as the guru of security. Of safety. Citing the recent earthquake, Joe takes hold of the metaphor and shakes his audience with it all over again. “The secret of existence is to have no fear at all,” Joe tells his spellbound crowd, before promising them, “mainframe-quality security” for the personal computers that, as we see in Mutiny’s easily hackable program, allow danger to creep into every home, right through the phone lines. In that box, Joe presents nothing, but promises everything—all for nothing. It’s the perfect Joe MacMillan pitch and, with Pace making the final appeal right to camera, it—like this third season premiere—is irresistible. And, after the danger of the earthquake has long passed, Donna discovers that one of the bedroom windows is cracked. Also, when Donna attempts to share the credit for Mutiny’s success with her husband (who, we overhear, is still footing many of the bills), neither Gordon nor Cameron is happy about it. Happy to see that odd couple pals Lev (August Emerson) and Yo-Yo (Cooper Andrews) are among the Mutineers still on hand in the company’s new California home. Less thrilled that Joshua Hoover’s obnoxious Bodie also made the trip—in case anyone was wondering, he still thinks farts are hilarious. The Halt And Catch Fire ’80s playlist continues to go for deep cuts. In the premiere, we get some Camper Van Beethoven and The Nerves. Keep ‘em coming. And that’s cool and all, but if Halt wants to just have Toby Huss croon some Sinatra every episode, I wouldn’t complain. Exploring their online world, Cameron notes that the rowdiest section of the community is the one devoted to comic book fans. That checks out. The earthquake metaphor’s a bit on-the-nose throughout, but when resentful Clark daughter Joanie (Morgan Hinkleman) bursts into tears, exclaiming “The whole house was shaking!,” her fear and confusion grounds it most effectively. That’s a great bit of framing from episode director Daisy von Scherler Mayer after the earthquake, startling the Clarks and Cameron (and us) with the popping toaster. Sign of how Joe will attempt to tamper with Mutiny this time around: Ryan is part of the crowd caught up in Joe’s pitch at the end of the episode. Plus, who’s got money on Joe already knowing about Bosworth’s grandson because of the Mutiny security flaw? As many have noted, Joe’s latest transformation sees him resembling John McAfee (there’s also some Steve Jobs in there), which doesn’t bode well for Joe.